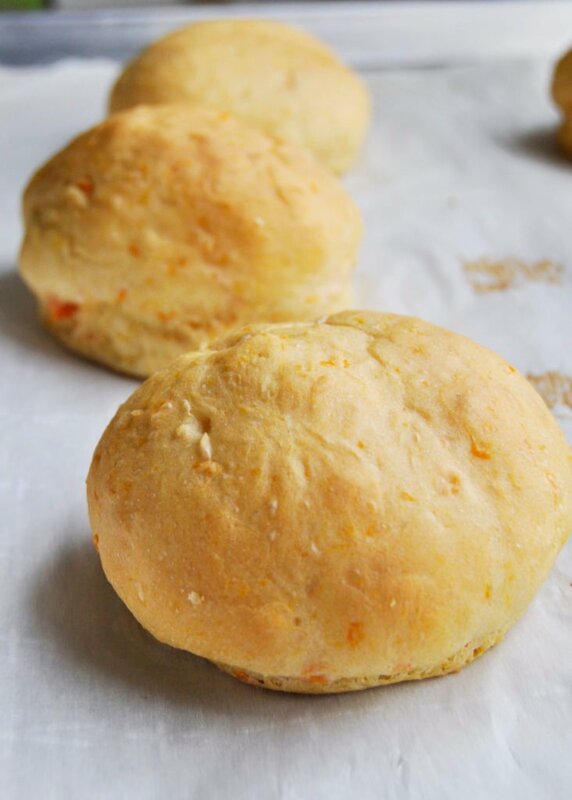 I love making sweet potato buns because they have the same fluffy and soft texture of regular hamburger buns, but with a whole new level of flavor. 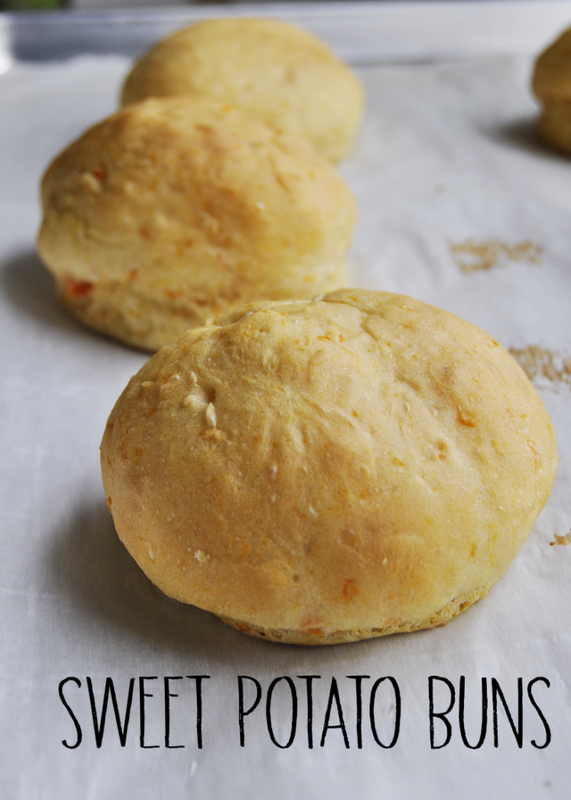 All you need is 1/2 cup of mashed sweet potato to take your standard bun to new heights! Sweet potato is a great source of vitamin A, and it adds extra fiber that basic white hamburger buns don’t have much of. If you’re looking for a little more fiber and nutrients, these buns can easily be made with whole wheat flour. As with many yeasted breads, there’s ample down time to account for when making this recipe. All in all there’s only about 15 minutes of active time, with the other time attributed to the two rises. Depending on the warmth of your kitchen, time spent waiting for your dough to rise may vary. 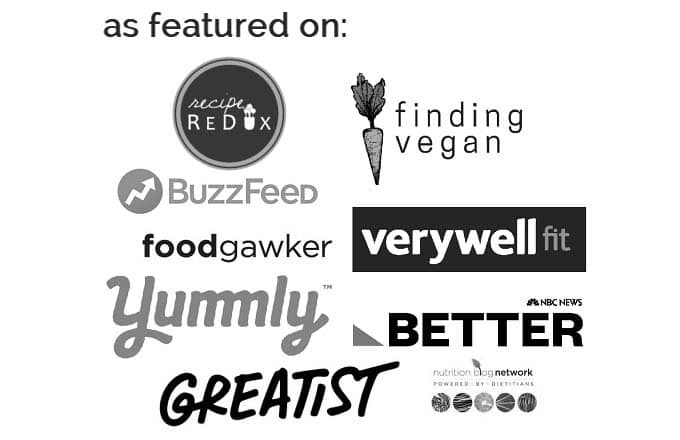 If you’re a multitasker, why not prepare the Best Beet Burger recipe while you’re waiting? Mix warm water (see note) and yeast in a large mixing bowl. Cover with a dish towel and let sit for 10 minutes, or until yeast is foamy. Add sweet potato, sugar, canola oil, and salt to yeast mixture. Stir to combine with a wooden spoon. Add in flour one cup at a time, stirring with a wooden spoon or mixer. Continue mixing until ~3.5 cups of flour are added. The dough should be soft and slightly sticky, but easy to work with. Turn dough out on to a lightly floured surface and knead for 5-6 minutes, until elastic and slightly tacky. Place the dough in a lightly oiled bowl. Cover with dish towel and let rest for 1 hour, or until doubled in size. Return dough to lightly floured surface, punching down to lightly deflate. Divide into 6 equal pieces. Roll each peach into a ball. 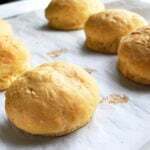 Place each ball on a parchment paper lined baking sheet. Cover and let rise for 30 minutes, or until the dough has doubled in size. Turn on the oven on to 350F at the end of the rising. 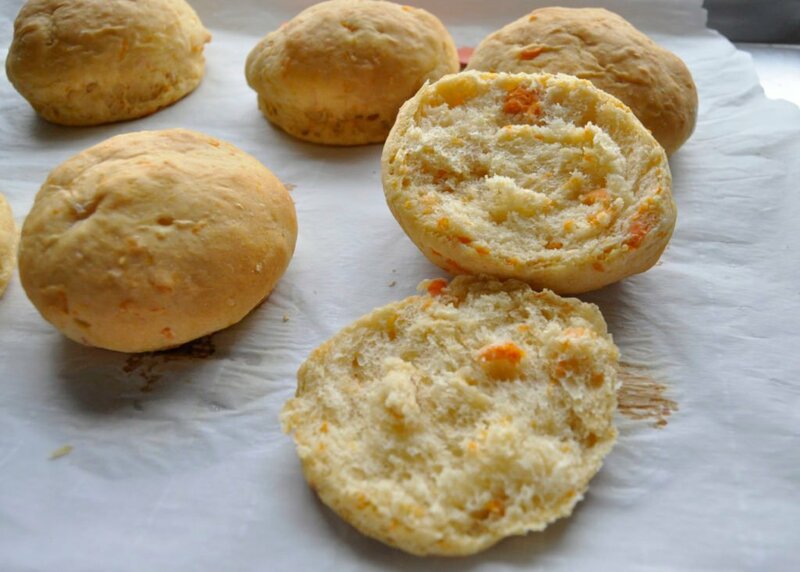 Bake sweet potato buns for 25-30 minutes, or until they are lightly browned. Remove from oven and set on a rack to cool. Store buns at room temperature for 3-4 days, or slice and store in the freezer if using later. Water should be no more than 110F or the yeast may die. I've found that 106-108F is an ideal temperature for happy yeast. If you don't have a thermometer, use your hand to test the water. It should be just hot enough that you can leave your hand under the water without it burning, like a hot bath tub. Substitute half of the all purpose flour for whole wheat flour if you prefer. 100% whole wheat is a bit harder to work with, so I usually keep it half white/half wheat.